Saturday trip was in the bay that did produce some bass and blue fish but it was work to get the few still plenty of bait. To days trip rebooked for fluke on Tuesday as the action has picked up down near SK point. Well, I know everyone is waiting for an up date. I had an open boat offer Nick and Mike stepped up and out we headed to BI at 0218 for Saturday. Right after the thunder storms passed. The ride was great except the rollers at NP once passed it was a great ride. We arrived at 0418 looked around for about 15 minutes and then lines over. At 0507 we had our first hook up and at 0513 first of many 30 plus pounders in the boat. At 0618 we limited out with at that time we thought we had our 8 fish on the boat. a recount and we had exceeded our limit and passed on a fish to another boat. The crew then decided to keep fishing but the deal was all fish would have to be returned to the water no matter how big. We went through 5 pounds of eels an average is about 8 eels to the pound. At 0830 we headed home. We released several fish that weighed on our boat scale over 45 pounds our average fish weighed between 35 and 45 pounds. Right after we pulled out we got a call from another boat that did one more drift and a friend of Joes landed his first over 52 pounds Striped bass. I will follow up with pictures. Runs to Martha's Vineyard have not produce as well as the BI. But some very large fish when we hooked. Fluke fishing has been very good but are going into deeper water. We are now catching in 70 ft deep water. Well its been awhile since we gave out a fishing report so I figured between the rain drops I would update what's going on. The pogy boats have taken all that they can for right now and DEM has denied them fishing in RI waters. As I usually tell everyone you can figure out that right around Fathers day they have pretty much cleaned out the bay. Well the striped bass are still here but we have to work extra hard to make bait. The bait shops are having a hard time right now getting poggies. That being the case we have to change our fishing techniques or where we fish. I have only done a few charters the last two weeks due to my five grandkids coming up from Texas for two weeks. Last Saturdays trip was a four person split share with two of our customers coming up from GA I picked I them up in NP in the heaviest fog of the year and headed out front our first time this season and did Joe and I get excited when we saw the bottom stacked like wood with bass. The seas were calm but with a four to five foot slow rollers. We hooked up on the second drift with a nice 30 pounder drifting live eels. I still thought was even bigger. Third drift a 20 pounder, a scup, blue and a rock crab. Then one of the locals wasn't feeling that great. So we headed in for some fluke action. We caught ton of fluke but only managed two keepers at 22 and 22.5 inches. We did find out later that a neighbor fished our spot out front and came home with eight keepers. Oh and another Charter captain called asked how we did out front, I told him where we went and yesterday he managed 8 striped bass with one being a 50 plus pounder. I tried to postpone Fridays trip because of winds and heavy rain, but the guys did not want to hear it so we fished from Tauton to Sandy point. We came home with a goose egg that's number three for the season and that hurts. Here we fished in the Tauton River we have been having a field day but last Thursday when I went up to fish the area the pogy boats had already been kicked out of RI and were now cleaning up in the Tauton River. Thursday trip we managed fish in the high teens to 20 pounds. Tuesday trip we managed fish up to thirty pounds and a limit for the boat. Well, now we are going to focus more on full day trips Striped bass fluke combos. The weather will decide the location. Mass fluke season starts 1 July with an 18.5 inch min size limit. Block Island has been hot and cold with good bass and dog fish. I did manage one tip with a friend on his boat two weeks ago to the Vineyard and caught some nice bass on scup. I was hoping for larger fish but they were all 34 inch plus fish. Sharking is starting to heat up and this upcoming two weeks is when the Tuna start showing up closer to home. We have one seat available for the Snug harbor Shark Tournament; I need an angler onboard because I will be at the helm, Joe the leader man/ tail rope / gaff man and JP I guess on the reel. The cost is approximately 300.00 for Two Days of shark fishing. This includes entry fee, bait, fuel. Food and drink you will need to take care of. If you cannot go both days we can work something out for one day on Saturday or Sunday. The entry fee also includes an awards and cook out at Snug harbor on Sunday evening. You have good days and the slow days and today between the rain drops (Saturday) Gary Poole from NH his son and daughter in-law from Atlanta GA made use of their down time while here in Bristol for his daughters wedding catching striped bass. Small bass are schooled up between Bear Point and Hog Island. We found keeper bass of Barrington beach using buck tail jigs with squid trailers and located keeper bass up to 30 inches at the southwest corner of PI. 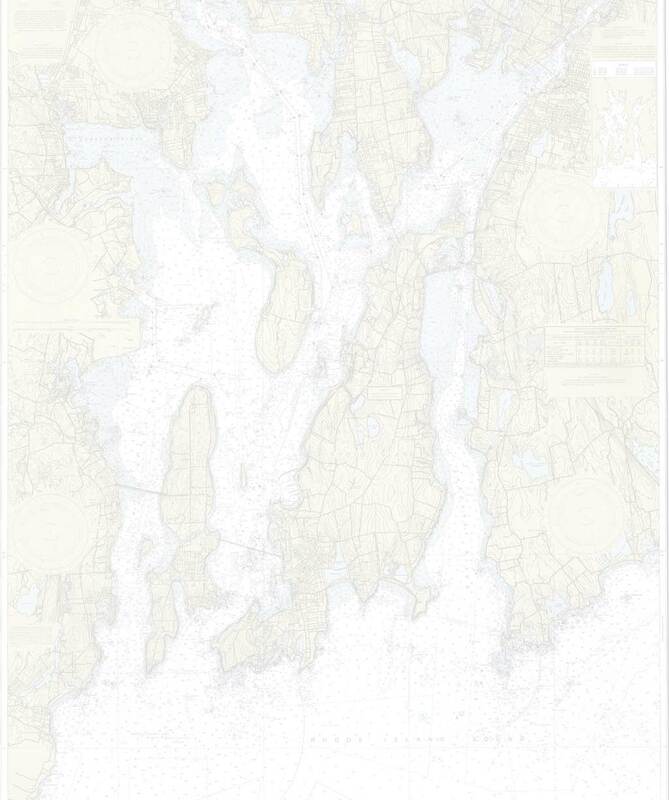 There is a large number of schoolies in the bay locating the large bass has been a challenge the last couple of days with the multiple passing lows. The Tautog has been the going thing if you can find the rocks that haven't been pick over. Things should really pick up this week. The action really picked up today in several locations, Brighton Street Bridge and Tiverton bridge and Stone bridge were hot for both shore and boat fisherman. Capt Joe Bagwell (River Rebel Charters) and JP Votaw show off several 5 pounders caught near Conimcut light house. They hook 12 fish in that area in less than one hour during the turn of the tide on green crabs. First report for River Rebel Charters 2009. Well Tautog season opened April 15 but the dandelions waited until this weekend to bloom. Old salts will tell you when the dandelions bloom the Tautog are in. The water temp was 47 degrees and may be the reason for the slow start along with the 15 seals spotted down near Newport RI. Striped Bass holding over from the winter are being caught in the Providence River on rubber baits. We expect the schoolies in this week with the larger fish in by May. Last year we boarded our first thirty plus on May8th. There is an unconfirmed report of squid in Newport but it seem that it maybe be a week early. Squid usually show up on the full moon near the 1st of May. We found the first menhaden (poggies) last year in Narragansett Bay on April 26th. With the weather finally breaking books are starting to pick up so call early and lets get on some of those early season bass. Fluke season has yet to be determined for the season. Joe and I will both be attending the hearings April 22 to fight for our fishery. We want our customer going home with enough fish but we want to protect tomorrows catch. Headed out last Saturday to Tiverton to where the bait and bass had been hanging and found nothing. Then we got some intel from another charter captain that he had found the bait and bass. So we headed farther north to Fall River and it was loaded with bait and bass and yes those pesky blue fish. There we landed several bass in the 15-20lb range and some blues. So it was another productive morning. Saturday afternoon was the awards banquet for the West Bay Anglers tournament. We attended and Capt Randy ended up taking second place. Always the bridesmaid never the bride. There is always next year. Out Sunday morning, there was no booked trip, to the same spot with the same results. Monday mornings party boarded the Rebel and off to Fall River we headed. There the bait was still loaded up and 2 nice bass were landed real quickly. Things got slow there for awhile but once the tide started to cooperate we landed 3 more nice fish and one 30 inch fish in about 30 minutes. Both guys onboard were psyched and it was time to head in for pictures and fish cleaning. As of right now Monday is booked but surprisingly Saturday is open and Fathers day booking had to be rescheduled so it is now open. Come on take dad fishing!!!! I might have screwed up here is this weekend report Well we have been very busy and I fell behind on the reports, but there are plenty of bass in the bay along with the bait. Menhaden are loaded in the Providence river near Edgewood. Tiverton you could walk on the bait Saturday and Sunday with Ark Bait now making his sets there at the mouth of the river. River Rebel Charters took 2nd in the 15th annual Striper Marina Bass Tournament with a 30.8 pound Bass. First place was 31.8. pound bass out of 191 register anglers. Last year we took 1st and second. We took one trip to Sakonnet Point Friday on a full day charter and brought home 12 keepers with three weighing in at 6 lbs. lots of 19 inch fish. Mt Rock and Bear point have been holding bass in the 20 pound range with YOYO being the way to take them. I will try to catch up reports after today's trip. The rains for Saturday the rip was re-scheduled so Joe and I decided we would spend the day collecting bait for the upcoming charter trips and try to get the bait pen full of poggies. The heavy rains and north winds made for a slow start. We started in the area that has been very productive all week for both large striped bass up to 30lbs and poggies but on Friday the blues moved in and it showed, As the large schools of bait now seemed to be broken up and scattered and on the move. After some running we ended up in the basin and found the bait so thick the depth sounded was showing 19ft when we knew we were 40 ft of water. As we snagged poggies one other local charter boats made several drifts in the channel but we never seen anything come over the side while we were there. We did hear later that a couple of bass in the 20s were taken. We ended up with 48 live poggies for the pen and a 5 gallon bucket full for the freezer. The report over the radio and cell phones on the most part was that what had been a great week of bass fishing now seemed to slow up. The water temperature had dropped some and the tides are running higher with the moon. Sundays schedule trip only had one passenger and the boat left at 0500. Capt Joe took the boat over to the area that had been productive all week and within minutes the live poggie was running for his life. Al missed the hook set and Joe hand over the second rod that he just put in the water and this time the hook was set. Al had been on the Rebel for about a half hour and already landed his first 18lb bass. Joe now having high expectations took the boat back around to start a second drift and the bite was over. There were a couple of other local charter captains on the same drift that reported to Joe that the bite was early and short. They searched several different areas before they called it a day but the angler went home happy. Even though the day wasn’t what was expected we believe that if you’re going to report the good days you need to report the days that weren’t that good. Fishing will pick up after this next front comes through. 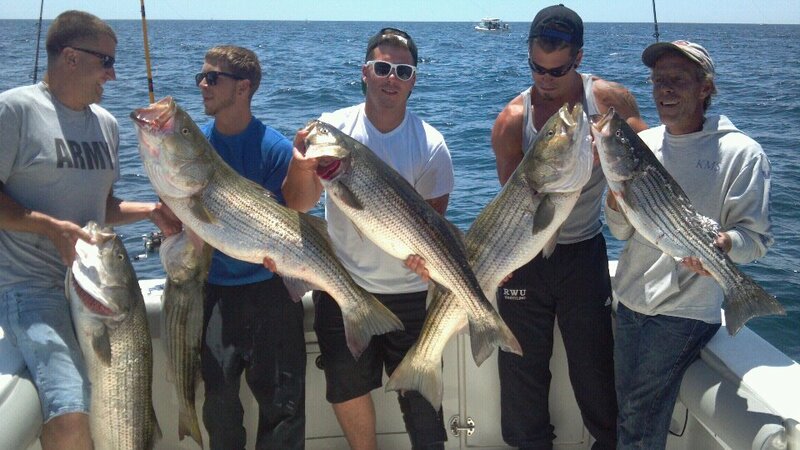 We still have some openings on our spilt shared charters call 401-253-9639. We have been keeping to ourselves in Mt Hope Bay using live bait and catching a limit of Bass on Thursday and Friday with some bass weighing in the low 30s. Friday morning the bluefish showed their ugly heads in the area we have been fishing but the bass still outnumber them. Thursday the bait didn’t show until late morning and Friday the bait was getting hammered hard by the Bass at 5AM. Wednesdays trip a lot of bait but small bass, fish big enough to cash it just not big enough to swallow. No trip schedule for Saturday unfortunately, just hoping the wind and moon don’t mess up my pattern. Reports from the radio it appears that there are some good fish around the islands. The trick is getting the bait to cooperate. We still have some spots open for Split Shared trips. dates in June avail are 7, 8, 9, 13, 16, 20, 23, 26, 27. This morning left the dock at 0600 with out a trip scheduled so I figured I get out and look around. The wind was out of the north water temp 56 degrees. Fifteen minutes after leaving the dock I came across some menhaden and set up to snag a few for some up coming trips and as the first one came to the boat a large bass was in tow of the bait. I set up a live line rig and went back to snagging as I snagged the next bait my live line was off and running. After a long 10 minute battle, the first 30lb 40 inch fish of the year for the River Rebel was onboard. I quickly hooked the next pogie up to the live line and off he went but I dropped that fish which appeared to be in the same weight class as the first. Now out of live bait I circled the boat back around my mark and snagged my next bait when all the sudden the reel started screaming and I landed a nice 36 inch fish. The problem today was I would snag a pogie a bass would be ripping them off the treble. It is now about 0700 and I can’t get a pogie to the boat because of the bass so I switch over to a jig until I can relocate the school of pogies which never appeared again but the bass kept blowing up on the surface. White and blue and white worked the best for me today in the 2 ounce class. I landed 7 bass in the 38 to 34 inch range and I don’t know how many under size bass came to the boat. If you could get the jig past the schoolies you would come up with a keeper size bass. The wind shifted out of the east and the fish were still working but the bigger fish seemed to have disappeared. So at 1000 called it a day. Today was a good day for Tautog, largest 6lbs 2oz but everyone caught fish. The wind was against the tide making it a little tougher to get set just the way we wanted but when you got set the bite was on with green crabs. After the tide change Captain Joe Bagwell thought he was seen some schoolie striped bass near use so we made the move to play with some stripers when we realized that we were in a large school of menhaden, so the scramble was on to re-rig and get some fresh bait in the freezer for the up coming run and chum for the shark trips. The bait was plentiful and cooperated for several hours. The boat was out of service for warranty work. Next report should be Friday 8/31, I have a trip planned for MV on Thursday in the Bay on Saturday and either BI or MV on Tuesday. Back in the Sakonnet River there was several large schools blue fish busting up and boats chasing these schools between Fog land and Gould Island. I was having an issue with myself and trying to figure out what I could have done different so that Ryan’s father would have had the feel of “Bowing to the Cow” and catching his first large striped Bass. So as I approached the schools of blue fish out came one spin cast so he could go home the next day knowing what it feels like to hook a 7 or 8 pound Blue fish.